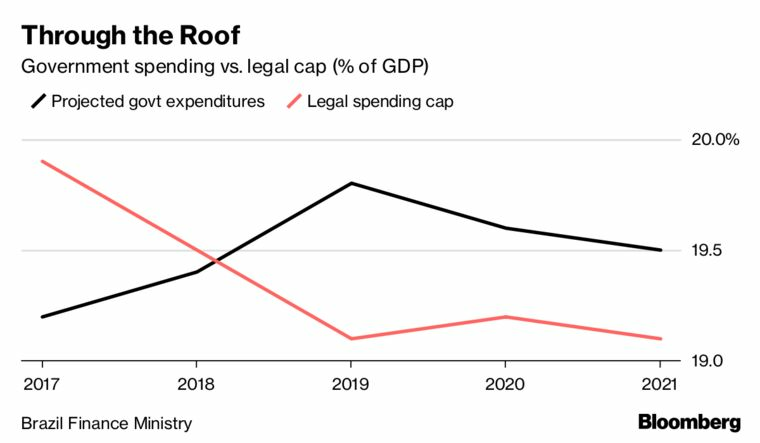 If nothing is done, the country’s budget will burst next year (see chart above), breaking a constitutional spending freeze, according to finance ministry projections. At stake is the future of the second-largest economy in the Americas and the creditworthiness of $950 billion in federal government debt. Like most countries, Brazil hasn’t done a great job balancing its budget, but the recent crisis has exposed perilous structural problems that lock it into ever more spending and larger deficits. With more than 90 percent of all budget items mandated by law, the government has almost no room to maneuver on spending. The article's opening leans toward the sensational, but the economy is in a bind, and the next president may not have the motivation to fix it. Politicians love to spend money that's not theirs (none of it is). Money is power, and the more money that flows into government coffers, the more powerful government grows. outro fantasminha dando like aqui ? Pois é, precisamos chamar os ghostbusters, né?